Training at emPower is unlike any experience you had! Because we view ourselves as coaches instead of trainers, we do more than simply run you through exercises. As coaches we aim to motivate, encourage, and bring out the best in you. You get excellent results because we have excellent coaches! At emPower, your program will include personal training services in a semi-private model at a minimum of 1x/week. You will not use machines at emPower, as research shows the best results are achieved by using functional, full body movements. We use a movement screening called FMS for all new clients that will reveal your unique strengths and weaknesses. We use this feedback in customizing your workouts. Depending on your goals, your program may include nutrition coaching. Our nutrition coaching encourages a series of small, effective changes that become permanent habits as opposed to severe and restrictive dieting patterns. Your game plan will depend on the goals you and your coach set together weekly. Our coaches will help you develop positive and empowering attitudes about your body, your nutrition, and exercise! 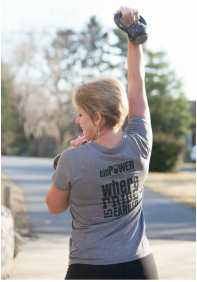 Lissa proudly works out at emPower! 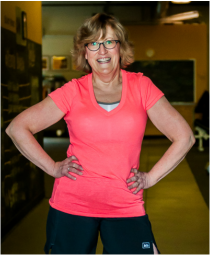 She is regularly committed to personal training, team training, and the occasional Sparta or obstacle course race. She has forever changed her own life and lost over 30 lbs since joining emPower over a year ago. The journey of personal training at emPower begins with you making the commitment to change in your life. 1. Call (717) 300-0543, or email us at info@empowertrainingsystems.com for more information or to set up a time to meet with us! Please feel free to stop by the studio for a visit to see what we look like in action! 2. After meeting with us, if you decide you want to train with emPower we will schedule a time to discuss your game plan session! During this time, we will talk about what pace you want to move toward your goals, how many times per week you are ready to exercise, and what nutritional changes will get your desired results. 3. After this meeting we will write your individualized program and workouts, you will be scheduled for your first training session and on your way to getting the results you want!